What do you get when dinner and dessert have a baby? 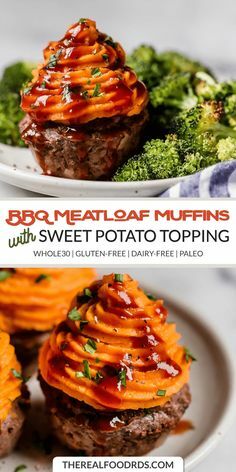 You get BBQ Meatloaf Muffins with Sweet Potato Topping thats' almost (almost) too cute to eat. Place ground beef in a medium bowl and set aside. Heat oil in a small skillet over medium heat. Add onions and sauté, stirring occasionally, until they start to soften. Add garlic, cook 30 seconds or until fragrant. Add onion-garlic mixture to ground beef. Add barbecue sauce, sea salt, pepper and dried thyme. Using your hands or a spoon, mix well to combine.